On the iPad mini, playlists let you organize songs around a particular theme or mood: operatic arias, romantic ballads, British invasion — whatever. Younger folks sometimes call them mixes. To create a playlist on your iPad, tap the Playlists tab at the bottom of the screen and then tap the New Playlist button at the top of the list of playlists on the left. You’re asked to name your playlist. Do so and then tap Save. 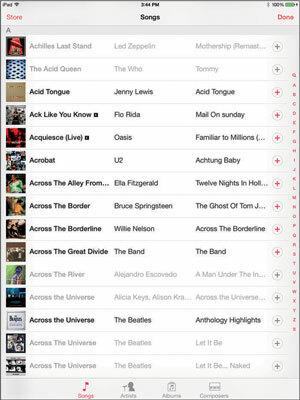 A list of all the songs on your iPad will appear in alphabetical order. Tap the ones you want to include; they’ll change to gray after you add them. After you’ve tapped every song you want in the list, tap the Done button in the upper right. You can select tracks for your playlist from the Songs, Artists, Albums, or Composers tabs that appear at the bottom of the screen while you’re creating your playlist. When that song is over or you tap the Next Song button, the next song in the playlist plays. This continues until the last song in the playlist has played, at which point your iPad shuts up. Of course, songs won’t play in order if you’ve enabled the Shuffle or Repeat functions. Although you can’t create Smart Playlists on your iPad mini, they totally rock. What is a Smart Playlist? Glad you asked. A Smart Playlist is a special playlist that selects tracks based on criteria you specify, such as Artist Name, Date Added, Rating, Genre, Year, and many others. Fire up iTunes on your computer and choose File➪New Smart Playlist to get started. And that’s all there is to selecting, creating, and playing songs in a playlist.